Hey folks. As you may know, I'll be making my annual pilgrimage to New Orleans later this week to check out Jazz Fest and The Ponderosa Stomp. 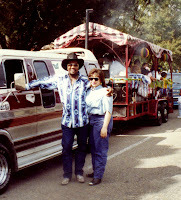 In light of that, I wanted to try and keep things in that Louisiana frame of mind, and talk a little bit about the first family of Zydeco. I saw Nathan Williams perform at my first Jazz Fest (some twenty years ago) and I was just blown away. I had no idea music like this even existed. Lucky for me, the good people at Tramps (my late, lamented favorite NYC club), began booking authentic Zydeco acts for a week at a time, and The Zydeco Cha Chas was one of them. My brother and I ended up meeting the band, and they told us "You ought to come down to St. Martinville the Sunday before Mardi Gras... there's a party goin' on!". I think they were kind of amazed that we actually showed up, and from that moment on we were alright by them. Sidney 'El Sid O' Williams, the oldest of the Williams brothers, took us under his wing. 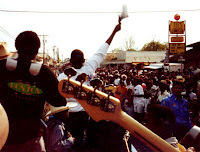 Along with owning his own 'one-stop' grocery store and fabled Zydeco and Blues club in Lafayette, Sid also acted as the band's manager, promoter, and (before Rounder signed them in 1988), their producer and record company owner as well. The very cool 45 you're grooving to now is, I believe, Nathan's first appearance on record. The whole town was rockin', and the absolute sea of humanity that pressed around as the band tore into one great song after another, was truly amazing. I knew Nathan was a star when I heard the local high school band playing Steady Rock. This was something else! We returned again and again after that, and not just at Mardi Gras. 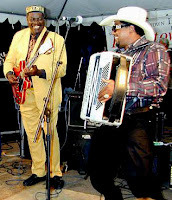 The Williams family opened our eyes to the incredible regional Zydeco scene that was still thriving in out of the way places like Lawtell and Opelousas (although if Sid ever found out we'd gone to somebody else's club, we were in trouble!). 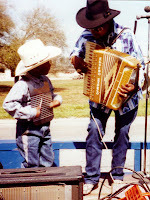 They taught us the difference between the 'button accordion' music played 'north of I-10', and Clifton Chenier's brand of 'piano-key' accordion that folks like Nathan were carrying forward into the next century. We became good friends, and whenever Nathan and the band played here in the Northeast, we were there, doing our best to return the hospitality the Williams family had shown us. One time in particular, we took the whole bunch of 'em to the top of the Empire State Building, then down under the ground for their first subway ride before showing them around Lower Manhattan. That was a trip! Although there's been some personnel changes from time to time over the years, one member who's been there since the very beginning is Nathan's first cousin, Mark Anthony Williams - better known as 'Chukka'. Truly a unique individual, I've had some of the best times of my life hanging out with him. His high energy style of 'rubboard' playing, along with his sweat-drenched brand of showmanship, make him a fan favorite and, in my opinion, the best in the business. Another person who's been around almost as long as Chukka is Nathan's brother Dennis Paul. In addition to being one of the greatest rhythm guitar players (in any genre) I've ever seen, he's also a world class artist whose deeply spiritual world view colors not only his art but his music as well (you can check out some of his paintings here, and also on the cover of the Cha Chas' latest album Hang It High, Hang It Low). As time marched on, we've shared some of life's biggest moments. The band played at my brother's backyard wedding at our own 'Moma House' here on Long Island in the early nineties, and have stayed there in between gigs when time allowed. After I got married myself, I made it a point to bring my new wife down to meet Mrs. Williams (she approved). We've been there as each other's children have come along, and watched them grow up together... they call us 'The Northern Williams'. There's been some sad times as well. Nathan's brother Steve (aka 'Scoopy-Doo') passed on some years back, and I still miss him. 'Uncle Harry' Hypolite, who played guitar with Clifton Chenier's Red Hot Louisiana Band for years, sat in with his nephew's Cha Chas whenever he could. A Louisiana blues legend, he was the real deal, man. I used to love watching him play. He was killed in an accident out on I-10 on a dark night in June of 2005. A tragic loss. Allen 'Catroy' Broussard was the saxophone player and all-around M.C. with the Cha Chas for years. Every show would begin with him blowing Warm and Tender Love real sweet and mellow, then asking the crowd if they were ready for 'Star Time' before introducing Nathan. He was a true gentleman, and one of the nicest people I have ever met. Complications from diabetes and lung cancer had kept him from performing for the last few years of his life. This past October he was released from the hospital, who had told him there was nothing more they could do for him. He called Nathan, and asked to see him. Catroy died of cardiac arrest in Nathan's arms on Halloween 2006. This past January, a massive heart attack would claim Nathan's brother Allen as well. He was the organist at their Parish Church in St. Martinville, and much loved by all who knew him. Through it all, this incredible family has survived. 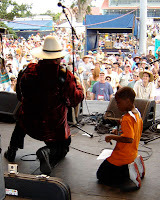 At Jazz Fest last year, Nathan's youngest son, Naylan, was out there playing rubboard (while 'Rat' Brown and Rob LeBlanc held down the bottom like they always do) and the crowd just ate it up. This year, his oldest son will be bringing his own smokin' band to Jazz Fest for the first time. 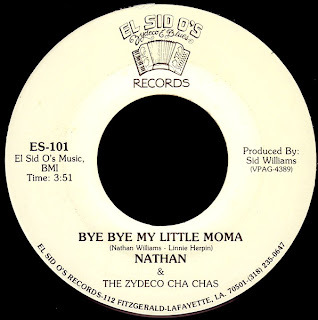 Lil' Nathan (yes, the same kid we met at Mardi Gras all those years ago) and the Zydeco Big Timers will kick off the second weekend, while his Dad will close it out on Sunday. How cool is that? They truly are the 'first family' of Zydeco, and I am proud to call them my friends. Just as I did with J Hines a while back, I wanted to bring this record over here to the B side in an attempt to draw some more attention to one of our cases over at soul detective. 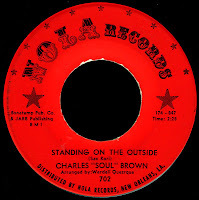 Case Four started out as an attempt to find out more about an artist named Charles 'Soul' Brown, who recorded a blistering single for Wardell Quezergue's fledgling NOLA label in 1964. Both sides of the record were written and produced by Sax Kari. Although we have yet to discover any more information about Mister Brown, the case has turned into somewhat of a 'Sax-A-Thon' (a phrase coined by the lovely and talented Dan Phillips), and we've been focusing on Mr. Kari's positively monumental contributions to this music over the years. Sax came up idolizing Charlie Christian, and took his place at the Lyon's Den in Oklahoma City after Christian died tragically young in 1942. Before long he was leading his own eighteen piece 'big band' and working the clubs out along the circuit. 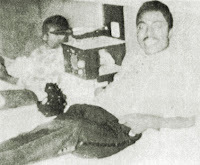 Kari was there at the very birth of the music that would come to be called 'Rhythm & Blues'. In addition to having a top ten hit of his own in 1953, he would go on to produce great records on people like Della Reese and The Falcons, laying the groundwork for 'Soul' as we know it. 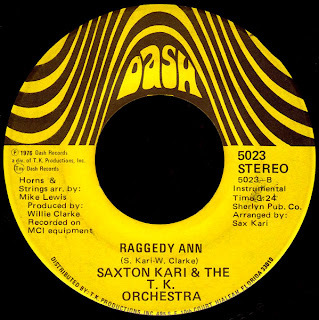 Sax Kari worked every angle of the music business, from record store owner and distributor, to running his own label, and virtually inventing the concept of 'promotion'. He developed a network of contacts at 'one-stops' and radio stations throughout the nation that he put to use for independent record men like Don Robey in Houston, Joe Banashak in New Orleans, and Henry Stone in Miami. Today's selection features Sax on the electric guitar and hails from the mid-seventies period that Kari spent with Stone's T.K. family of labels. Like I said over on SD; "Another of 'Saxton's' fractured easy listening pieces, this time filtered through the disco-era T.K. Orchestra, you just gotta love it. You can almost see yourself cruising along in like a '75 Impala convertible, just digging the scenery..." Yeah, baby. Anyway, to make a long story short, we've been fortunate enough to be in contact with the now 87 year old Mr. Kari throughout our 'investigation', and had been trying (albeit unsuccessfully) to drum up some interest in booking this living legend for a live performance. Unfortunately, about a month ago, Sax suffered a 'mild' stroke, and is now in a nursing home in Florida undergoing physical therapy to try and regain the use of his right hand. Despite his recent series of bad breaks, Sax remains positive and hopeful, and continues to write, using a portable keyboard he set up in his room at the nursing home. 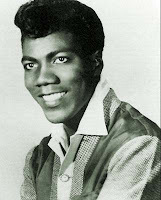 Don Covay was born in South Carolina, but moved north to Washington D.C. shortly after his Baptist Minister father passed away in the mid-forties. His family kept close to their religious roots, and soon formed a Gospel group called The Cherry Keys that performed locally. 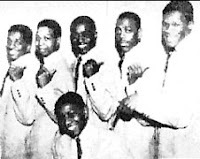 While still in High School, he was invited to join The Rainbows, a hot DC doo-wop group that had recorded for Bobby Robinson. After cutting a few sides on Pilgrim that went nowhere, the group broke-up. 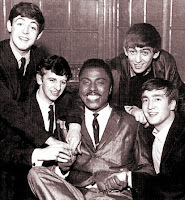 Although the exact circumstances are up for grabs, this was right around the time he met Little Richard (in Sweet Soul Music, Peter Guralnick says that Covay was opening a show for Richard, while in The Quasar Of Rock, Richard himself says that he met him while in Washington to record Keep-A-Knockin'). Richard goes on to say that Covay "hung around me and my band, then he started to drive me places. I called him 'pretty boy'... he wrote a song based on that title and I said that he could use my band to record it..." The resulting single, Bip Bop Bip, was picked up by Atlantic in 1957, and is one of the greatest recorded examples of The Upsetters in their absolute prime, while Covay just rips it up, doing his best Little Richard. The artist credit on the record actually reads 'Pretty Boy'. I love it. The next few years would see him recording for a dizzying number of labels. 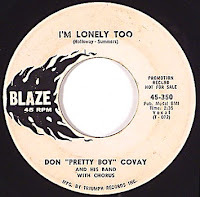 Blaze Records credited him as Don "Pretty Boy" Covay, while on his subsequent Sue effort, he's simply Don Covay. To confuse matters further, Firefly listed him as 'Don Covay of the Rainbows', while on Big Records he was back to being known simply as 'Pretty Boy'. In any event, none of these records went anywhere. He signed with Columbia in 1961, recording another trio of singles that died on the vine, before becoming one of Florence Greenberg's Soldier Boys on Scepter. A one-off single for Epic would follow, without much luck. Meanwhile, a song he had written with former Rainbow John Berry, Pony Time, was released on Arnold Records, and would reach #60 on the pop charts. When Parkway Records released Chubby Checker's version of Pony Time in early 1961, it would blow by Covay's, going all the way to #1 both R&B and Pop on its way to becoming an even bigger hit than The Twist had been a couple of years earlier. 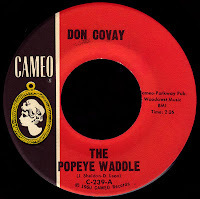 Cameo (Parkway's parent company) signed Covay to the label the following year, and would try to cash in on yet another dance craze, The Popeye. 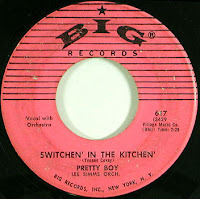 While Checker's Popeye (The Hitchiker) broke into the top ten, the single they released on Covay barely crawled to #75. It was called The Popeye Waddle and, despite a catchy Contours like number that promised 'you'll do fine if you get in line', it failed to catch on. The flip of that single, One Little Boy Had Money, hinted at the vocal style that was to come. Something called Do The Bug would follow, along with two Parkway singles that went nowhere. The success of Pony Time, I'm sure, helped convince Don that his songwriting skills were in demand (as he would later explain to author Gerri Hirshey, "copyrights last longer than record labels"), and he moved to New York City. He began hanging around The Brill Building, and soon was writing songs for Roosevelt Music, the most respected name in R&B publishing in those days. It was during this period that he met Jesse Stone, who worked with him on composing 'happy blues' that were radio ready. 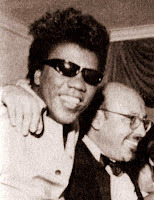 Stone introduced him to Jerry Wexler, who had been hanging around the Brill Building ever since his Billboard days. 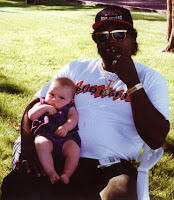 Wexler had just signed Solomon Burke to Atlantic, and was on the lookout for material for him. 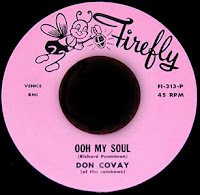 Covay knew the type of singer that Solomon was, and was able to tailor the follow-up record to his 1962 smash Cry To Me, specifically to him. I'm Hanging Up My Heart For You remains one of Burke's all-time classics, and marks the beginning of a life-long friendship and collaboration that would send songs like You're Good For Me and Tonight's The Night soaring into the top ten over the next few years. 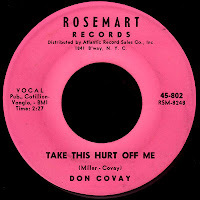 I'm not sure why, but Atlantic was releasing Covay's own singles on a subsidiary label called Rosemart at that point (I've never seen records by any other artist on that imprint. have you?). 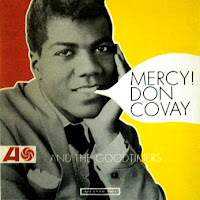 Mercy, Mercy would crack the R&B top 40 in the fall of 1964, and essentially define Covay's own brand of funky guitar-driven R&B. There has been much speculation over the years about whether or not Jimi Hendrix played on that record (and Covay's next Rosemart release Take This Hurt Off Me), but there doesn't seem to be a definitive answer. One thing appears to be certain, that Covay (who wrote using the guitar instead of piano) is playing on those cuts. I like that. Atlantic collected those singles, along with other material cut at their New York studios in 1964, and released Covay's first LP, Mercy!. In an interesting aside, Don had been using the name 'The Goodtimers' off and on since the first release of Pony Time in 1961. The name appears on the Rosemart singles, as well as on his Atlantic releases (like today's selection) until 1967. It apparently refers to the vocal group that backs him up on those records (sometimes, however, it sounds like only one other voice), but I can't for the life of me find out any information on who they might be. It seems possible that it was just Covay overdubbing a second harmony vocal (as was all the rage back then) but I don't know... In any event, his next single, Please Do Something, (featuring The Goodtimers, of course) went to #21 R&B in early 1965, becoming his biggest hit yet. 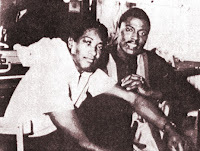 That was the summer that Wexler brought Wilson Pickett down to Stax to record his blockbuster hits In The Midnight Hour and 634-5789, and he figured it made sense to do the same with Don Covay. 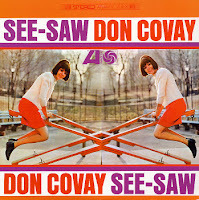 Just as Pickett had done, Covay collaborated with Steve Cropper to write the biggest-selling record of his career, the incredible See-Saw. It would spend almost four months on the charts, reaching #5 R&B and almost cracking the top 40 Pop (As good as this record was, I'm here to tell ya that the incendiary version that Aretha would take to the top ten in late 1968 is better... just ask Larry Grogan). All in all, Covay recorded four sides at Stax (one of which was the amazing Sookie Sookie) before things got a little rough. 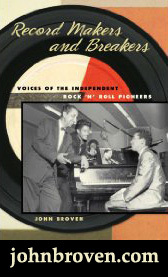 According to Cropper; "Jim Stewart called Jerry Wexler and said 'Get Don Covay out of here. He's driving us nuts!'... I loved Don to death. We got along great, but I don't think Jim and them understood Don. 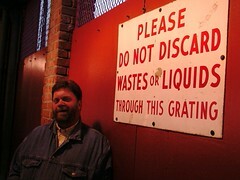 He thinks in different areas... He jumps from this place to that. You never know what he's going to do next." Stewart used that, along with the house band's supposed dislike of Wilson Pickett, to bar Atlantic from sending any more of their artists down there in December of 1965. As we talked about last week, this was the same period in which Covay wrote (and sang on) I Don't Know What You've Got (But It's Got Me) for his old friend Little Richard. As B side regular Lyle pointed out in the 'comments' on that post, Guralnick called that song "arguably equal to James Carr's The Dark End of the Street as the greatest soul ballad of all time... the Mt. Rushmore of soul." I will second Lyle's "Amen" to that. 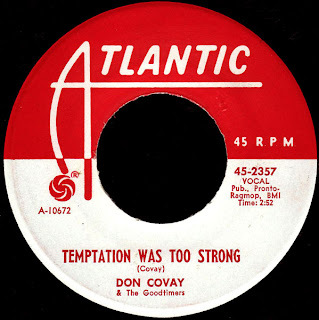 After both Sookie Sookie and Iron Out The Rough Spots (the last of the Stax-recorded material) failed to chart in 1966, Atlantic brought Covay back into its New York studios to record today's cool B side. The flip of Somebody's Got To Love You (which didn't chart either), I think it has the same kind of vibe going on as the Little Richard record. 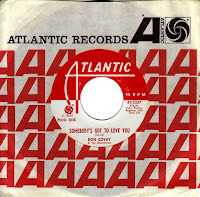 With Atlantic's 'A team' (including King Curtis and Bernard Purdie) backing him up, I just love the way Covay name checks the whole Soul Clan on here, almost two years before the release of their lone single. You know, it's been commonly thought that Ben E. King was a last minute replacement for Wilson Pickett after he balked at the idea of being a member, but this way cool record would seem to prove otherwise... Don had him on the list all along! He would return to the R&B top 50 with Shingaling '67, and In August of that year, Atlantic sent Covay down to American Studios in Memphis to record another unacknowledged soul masterpiece, It's In The Wind, one of my favorite records ever. 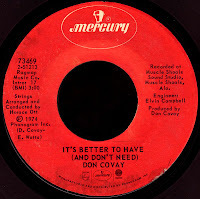 Covay was every record company executive's dream, a staff songwriter who could deliver the hits. Leonard Chess had begun using some of his material (think Etta James), but in late 1967, Atlantic would record what remains his best known work, Aretha Franklin's Chain Of Fools. With Joe South's tremelo-laden guitar tuned way down low to start things off, this immaculate Wexler production 'arranged and directed by Tom Dowd & Arif Mardin' cruised to #1 R&B (#2 Pop) in early 1968, and is simply one of those timeless songs that will never die. 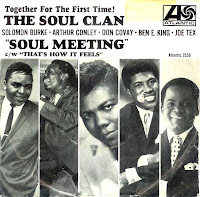 I know we've talked about The Soul Clan before (in our Solomon Burke, Joe Tex, and Arthur Conley posts), but it's important to remember that the whole thing was Don Covay's idea. He was the one spinning the elaborate aspirations, daring to imagine a world in which Black Americans could control their own destinies. According to Solomon Burke, they had initially asked Atlantic for a million dollar guarantee up front, and the project was to include a complete album of material. The Clan was reportedly waiting for Otis Redding to fully recover from minor throat surgery when he died in that infamous plane crash in December of 1967. Covay, more than ever now, was committed to making his dream come true. He wrote and recorded the basic tracks of the single out in Hollywood with (an uncredited) Bobby Womack, and the rest of the Clan overdubbed their vocals as their schedule permitted. Arthur Conley, of course, would replace Otis, and Soul Meeting broke into the R&B top 40 in the summer of 1968. Although a great record, the Soul Clan's moment seemed to somehow already have passed. Whether it was due to a conscious decision on the part of the Atlantic brass (as Covay and Solomon Burke believe to this day) or not, that would be the end of that. As the decade came to a close, Covay would start up another project, The Jefferson Lemon Blues Band. Along with John Hammond and Joe Richardson (whom Covay had worked with in The Soldier Boys), he created a very cool concept album called The House Of Blue Lights. The All Music Guide lauds it as "the sonic and spiritual blueprint for Let It Bleed and Exile on Main Street and parts of Layla & Other Assorted Love Songs". There ya go! Black Woman, a single by the band would chart in early 1970, and would be Covay's last recording for Atlantic. Stops at Polydor and Janus would follow, before Covay signed with Mercury Records, reportedly working A&R for them as well. Superdude, his way cool 1973 album, would produce awesome cheatin' classics I Was Checkin' Out She Was Checkin' In and Somebody's Been Enjoying My Home. It's Better To Have (And Don't Need) clocked in at #21 R&B in 1974, followed by Rumble In The Jungle and one last Mercury album, Hot Blood, the following year. He joined with Gamble & Huff at Philadelphia International for the disco-flavored No Tell Motel and Travelin' In Heavy Traffic in 1976, but the records didn't do much at the time. I'll tell ya though, the funky B side Once You Had It almost made it as today's selection... it's bad, yo! A single called Badd Boy on the Newman label would hit #75 in 1980, and that would be the end of Don's charting career. In 1981, he was the man behind the long awaited Soul Clan reunion, which ended up being not much more than a press conference and a poorly planned concert. 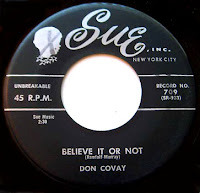 In any event, Covay still believed. As he told Guralnick; "The Soul Clan was to me the greatest thing that ever happened. I think the kind of love we had was an everlasting situation. If any of us ever need each other, you know we gonna be there." 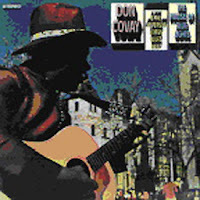 In 1992, Don Covay had a serious stroke that severely limited his abilities. He was unable to attend the ceremonies when the Rhythm & Blues Foundation presented him their pioneer award the following year. Through the love and support of his family and friends (the Rolling Stones apparently bought him his own rolling rehab facility), Covay has gotten better. He actually released an album called AdLib in 2000, on which he was joined by Wilson Pickett, Otis Clay, Dan Penn and Ronnie Wood. 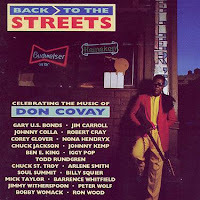 Just last year, an album called Back To The Streets - Celebrating The Music Of Don Covay pulled together people like Wood, Mick Taylor, Gary U.S. Bonds and Robert Cray in a joyous tribute to Covay's incredible career. The BMI Repertoire database lists him as the writer or co-writer of some 340 songs. 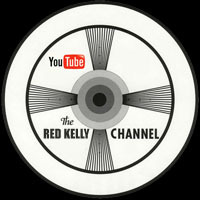 Songs that run the gamut from Doo-Wop to Rock & Roll, R&B, Soul, Blues and Funk. 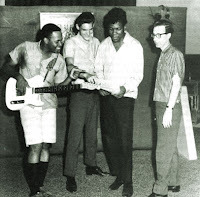 Don Covay's unique genius encompassed it all. 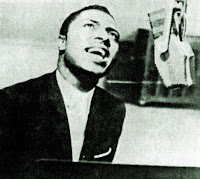 Richard W. Penniman grew up in Macon, Georgia singing Gospel with his brothers and sisters in a group called The Penniman Singers. Although the family was religious, his father sold bootleg whiskey and ran a nightclub, maintaining a delicate balance between the sacred and the profane that would stay with Richard for the rest of his life. The South he grew up in was totally segregated and, despite their inherent poverty, the black community developed a culture and language all their own. The depth of the black experience was reflected in the rich tradition of Gospel music that seemed to pour out of the churches and on to the streets. 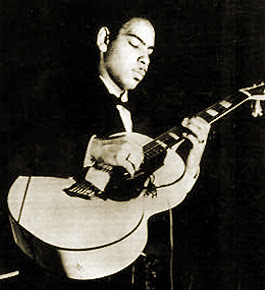 Young Richard was impressed by the power behind people like Brother Joe May and Sister Rosetta Tharpe, and when Sister Tharpe invited him up on stage to sing with her at the Macon Auditorium, he was hooked. It was also a South of hucksters and 'flim-flam men', colorful itinerant characters that fed off of people's dreams and superstitions. Richard was fascinated by all of this, and left town with a 'snake oil' salesman named Doc Hudson when he was sixteen years old. Traveling the same circuit as the burgeoning postwar R&B scene, he was soon picked up as the lead vocalist for B. Brown's Orchestra, who christened him 'Little Richard'. Life on the road appealed to him, and he began working in various traveling Minstel Shows with names like Sugarfoot Sam from Alabam' and The Tidy Jolly Steppers. He gravitated towards Atlanta, becoming a member of the Broadway Follies, and performing regularly with some of the great names in R&B. His favorite, by far, was local luminary Billy Wright. Known as 'The Prince Of The Blues', Wright was a regular visitor to the R&B top ten in the late forties and early fifties and, in Richard's own words, "He really enthused my whole life. I thought he was the most fantastic entertainer I had ever seen." Wright performed in heavy make-up, and wore his hair high in a wavy pompadour. Richard ate it up. Becoming a member of a loosely-knit gay community that had grown up out of the cross-dressing female impersonating tradition of the minstrel shows, he soon became friends with the legendary S.Q. Reeder (aka Esquerita), who taught him how to play the piano. When Billy Wright brought him to the attention of prominent Atlanta dee-jay Zenas Sears, he recorded a few sides on Richard, and got him a contract with RCA in 1951. One of those records, Every Hour, became a local hit, and Richard returned to Macon a home-town hero. After a second Atlanta session in 1952 failed to make much noise, Richard began singing weekends with the Percy Heath Orchestra, while washing dishes at the Greyhound Bus Terminal in Macon to help feed his family. Local promoter Clint Brantley convinced him to start his own band, The Tempo Toppers, and got him work out on the circuit. Over the next few years, Richard made a name for himself, holding down engagements at fabled nightspots like The Dew Drop Inn and The Club Tijuana in New Orleans, and the Club Matinee in Houston. He signed with Don Robey's Peacock label, but things soon came to a head, with Robey actually beating the independent-minded Richard up and throwing him out of his office! It was Lloyd Price that suggested that Richard send off a demo tape to Specialty Records. Although it took a while, they finally got back to him and arranged for him to meet their producer and A&R man, Bumps Blackwell, at Cosimo's studio in New Orleans in October of 1955. After recording a few underwhelming slow blues numbers with the house band, Bumps called a break and took everybody over to the Dew Drop for lunch. Ever the entertainer, Richard got up on stage and ripped into a bawdy up-tempo number that he'd been including in his act for years. Blackwell was floored, and grabbed local songwriter Dorothy LaBostrie to clean up the explicitly sexual lyrics so he could rush everyone back to the studio and record what he just knew would be a hit record. It was so much more than that. More than any other single recording that I can think of, Tutti Frutti just changed everything. 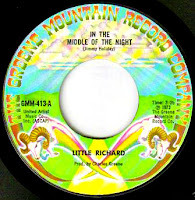 Richard's high energy piano and vocals backed by the white heat generated by Earl Palmer, Lee Allen, and Red Tyler somehow took everything that came before it and crystallized it into a whole new art form that shook the music industry to its roots. 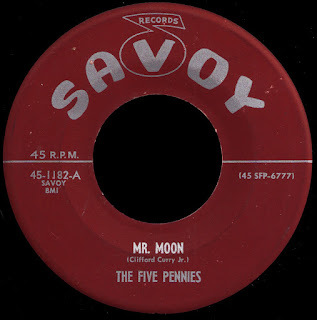 As it settled in for its six week stay at #2 on the R&B charts (only kept from the #1 slot by Priscilla Bowman and Jay McShann's smash Hands Off), Dot Records rushed out a cover version by Pat Boone that racist radio programmers plugged until it surpassed Richard's original version on the Pop charts in early 1956. When they tried the same thing with the follow-up record, Long Tall Sally, Boone's version finished a distant second to Richard's top ten smash. With his new band, The Upsetters, Little Richard was wreaking havoc wherever he went, integrating sold out houses throughout the South through the sheer power of his personality. He was, truly, the first real rock and roll star. Before long he was headlining Alan Freed's package shows, as there was literally no one that could follow him. He continued to dominate the charts, as Specialty released one great record after another, with even the B sides (like Slippin' And Slidin', Ready Teddy, and She's Got It) cracking the R&B top ten on their own. Before long, Hollywood wanted to get in on the act, and Richard had appeared in three movies by the end of 1956, most notably in The Girl Can't Help It with Jayne Mansfield, for which he performed the title song. Literally at the top of the heap, Little Richard and the Upsetters continued to tour the country, setting attendance records wherever they went. 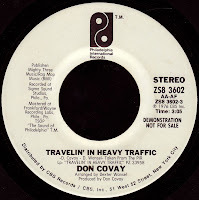 It was at one such swing through Washington DC that a local singer and songwriter named Don Covay would join his entourage as a valet and driver. Richard would nickname him 'Pretty Boy', and he became a part of his 'traveling circus'. Richard had begun to have doubts about the fast life he was leading, and had been speaking with fellow musician Joe Lutcher about leaving it all behind and joining the ministry as Lutcher had done a few years before. 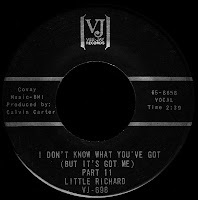 On a tour of Australia in late 1957 (with Gene Vincent and Eddie Cochran), Richard had what amounted to a vision, and decided to walk away from it all with ten dates still left to play. By the time he returned to the States, the papers were full of all kinds of exaggerated versions of the story. 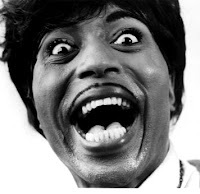 Little Richard agreed to play one more previously booked date at the Apollo, which Alan Freed was now able to bill as his farewell performance. The crowd went nuts. Richard took his new found faith seriously, and entered a 'Bible College' in Alabama. He and Joe Lutcher began traveling as The Little Richard Evangelistic Team, and preaching the word of God to enthusiastic crowds across the country. 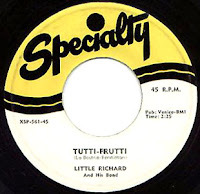 Specialty began to release some material it had 'in the can', and Richard continued to chart regularly in 1958, even though he was no longer recording. By 1960, he had hooked up with George Goldner, and cut some Gospel sides for his End label. 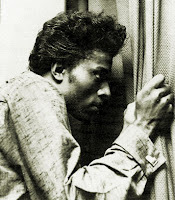 Bumps Blackwell, meanwhile, was now working A&R for Mercury, and produced an album called Little Richard - King Of The Gospel Singers with Quincy Jones providing the arrangements. Mercury released a few singles from the album but they, predictably, didn't sell. Richard's old habits had begun to resurface at this point, and he soon found himself at odds with the religious establishment. In 1962, Richard was approached by a British promoter named Don Arden. He persuaded him to come to England as part of a package tour that would also include Sam Cooke. 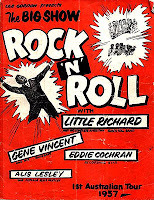 Whether or not Richard had agreed to perform his secular music in advance is a matter of speculation, but the fact remains that Arden billed it that way, promising Richard's return to the rock & roll stage. He brought with him a fifteen year old organist he had met through Mahalia Jackson and the Los Angeles Gospel community, Billy Preston. As far as Billy knew, he was going to be playing Gospel. When Cooke's plane arrived late for the first show of the tour, Richard went out and performed some of his low key sanctified numbers like I Believe and He Got What He Wanted (But He Lost What He Had), before 'phoning in' a perfunctory medley of his biggest hits. The crowd, and Don Arden, were not happy campers. When Sam finally arrived, Arden pleaded with him and J.W. Alexander to convince Richard to get out there and do the right thing. 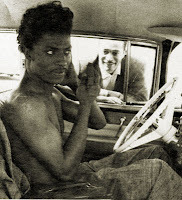 Alexander, a veteran of the 'Gospel Highway', knew Richard from his days at Specialty, and assured Arden that once Richard saw Sam just 'killing' the crowd, there was no way he was going to let him get away with it... that Richard's competitive nature would force him to do his best to win the audience back. That is exactly what happened. 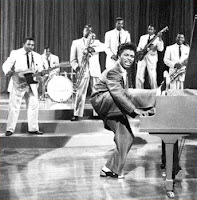 Little Richard went out there night after night and just slayed 'em, pulling out all the stops until the crowd knew it was in the presence of greatness. The tour was extended to include a stint at the Star Club in Hamburg, Germany where a young group of British lads was just learning the ropes. They fawned over him, learning about rock & roll from the man who invented it. Within about a year, those same kids would dominate the American pop charts, and the 'British Invasion' had begun. Their second album introduced Long Tall Sally to a whole new generation of white American kids (like me) who remained totally unaware of the song's origins. 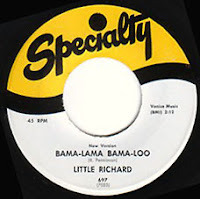 Richard, meanwhile, signed a one record deal with his old boss Art Rupe at Specialty, producing a single cut from the old mold, Bama Lama Bama Loo which crawled to #82 on the R&B charts in the summer of 1964. Looking around him, he could sense how R&B had been transformed into Soul in his absence, and he set out to show everybody that he had plenty of it. Signing with Vee-Jay later that year, he re-recorded a number of his old hits for the label before waxing our current selection in early 1965. Truly a great soul record, it was written by his old pal Don Covay, who I believe is singing that falsetto second vocal. 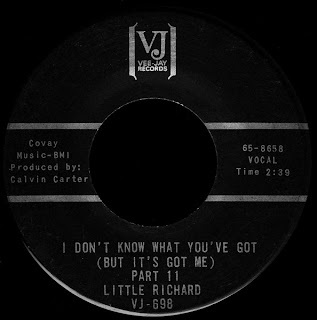 The A side of the single (Part l) would spend eight weeks on the R&B charts in the fall of 1965, climbing to #12 and proving that Richard could get out there and emote with the best of 'em! (Covay's own See-Saw would ride to #5 during the same time frame.) A young guitar player that called himself Maurice James was passing through Richard's band at the time, and that's him playing those little frills in the background. He would go on, of course, to become known as Jimi Hendrix, and use that same guitar pattern on songs like One Rainy Wish a few years later. In 1966, Hendrix told a reporter "I want to do with my guitar what Little Richard does with his voice." Cool. 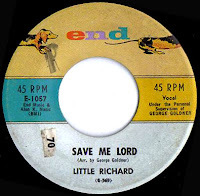 After Vee-Jay went bankrupt, Richard recorded a few unremarkable sides for Modern before teaming up with Johnny 'Guitar' Watson at Okeh to produce a number of great soul sides like Poor Dog (Who Can't Wag His Own Tail), which almost cracked the R&B top 40 in the summer of 1966. He moved on to Brunswick the following year, and songs like Try Some Of Mine showed he still had it goin' on. By 1970, Little Richard was again selling out performances and headlining various 'rock & roll revivals', even making the cover of an upstart magazine called Rolling Stone. He found himself making regular appearances on TV variety shows hosted by people like Mike Douglas and Merv Griffin, and his unique and charismatic personality made him a fan favorite. 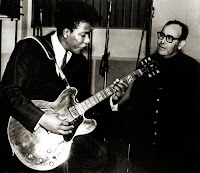 He signed with Reprise Records, an arrangement which would produce his biggest hit in years, Freedom Blues. It would spend a month on the charts that summer, and he hit the road to promote the album it came from, The Rill Thing. He was back on top. In 1973, he cut a couple of great Jimmy Holiday songs for a label called Greene Mountain and, although In The Middle Of The Night crept to #71 R&B, it was almost as if he had trouble being taken seriously as a soul performer, after billing himself in places like Vegas as the 'Bronze Liberace'. Just as had happened some twenty years before, his 'too much is not enough' lifestyle pushed him over the edge and back into the ministry. Taking up his cross, he became a salesman of the 'Black Heritage Bible', and preached his message wherever and whenever people would listen throughout the late seventies and early eighties. The publication of Charles White's red hot biography The Life and Times of Little Richard - The Quasar of Rock in 1984 did much to bring him back into the public eye, a place he always secretly longed to be. 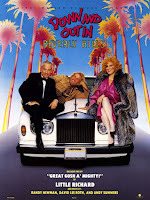 His role in the 1986 film Down and Out in Beverly Hills helped propel a song he wrote for the film with old buddy Billy Preston, Great Gosh A'Mighty!, to #42 on the pop charts. He began performing again, and is still touring to this day. The past twenty years have seen him come to terms with the dualistic nature of his personality, and make peace with the idea of being an instantly recognizable Pop Icon and a true Christian at the same time. Appearances on Sesame Street, and a Disney album of children's songs brought him a whole new army of fans, and he became a household name once more. More recently, that awesome Geico commercial, in which he proclaims his love for 'mashed potatoes and gravy and cranberry sauce! ', has made him a 'celebrity' to yet another generation. A direct influence on everyone from Elvis and The Beatles to Otis Redding and James Brown, it's hard to think of a more important figure in American popular music.